At what level can you begin to cast Daring with this helm?? Ok I have it and love it, I can heal around 700 points per minute with it which is about twice as fast as sitting, meditating and then casting GHeal. My question is whether there is a way to activate right click effects from a social macro? With a spell or ability, I can use like /cast 4 or /doability 4 with pauses and then repeat like to cast GHeal 5 times. I can copy the helm slot from my inventory to a hot key and then press 4 to activate this (instead of right clicking in my inventory). But I would really love to set up some hot keys that activate this like 3, 6 or 9 times so I can AFK during the minute or two that its healing me up after a fight. How to activate a hotkey from a macro? I don't think you can build hotkeys that use other hotkeys. If you could, it would be possible to make key 1 perform key 2 five times, and key 2 perform key 3 five times, etc, so that you would eventually be able to program 5^9 (nearly 2 million) instances of key number 10 (or 0). So, if key #0 was set to "/gsay <in some foreign language> something", you could in theory hit key 1 and spam your group 2 million times, thus maxing out their language (or at least bringing it up one higher than your own). Also, if key #2 said do key #3, and key #3 said do key #2, hitting either key would throw you into an infinite loop. For these reasons, SOE doesn't let you use hotkeys within hotkeys. I recently bought this nice little helmet for my level 10 Paladin for only 50 plat. I'm not sure if he just wanted to get rid of it because he couldn't use it or what, but I really don't care. It adds about 40 ac (not sure how the whole ac thing works and how a 21 ac helm can add 40 ac but it does, I swear) which is really nice at my level. Could someone please explain that? yeah, not to sure how it works, but my pally gets (or got havent checked if its changed) 3 AC on him per 1 ac on a piece of his equipment. 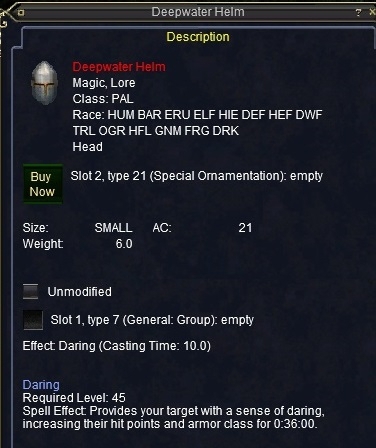 Will a focus effect such as Haste II work to increase the casting speed of the Deepwater helm? I'd appreciate any info before I buy an item with such an effect to test it myself. Thanks. Well, on Seventh Hammer, the bazaar has driven prices way down, and I have been getting items much cheaper than I previously thought imaginable. I got this for 400pp a few days back from a PC in the bazaar. The AC is great, and it looks great. I finally have a helmet graphic! I was using a Ry'Gorr Chain Coif previously, and the graphic wouldn't show because I had Velious textures off (when I turned them on, other items would not show--go figure). I think the Deepwater items are okay, but not all of them are great. The items that have stats are good, as well as this helm, since it has a heal function (which is not usable until level 45, so I know I will have to wait). Other items, which have good ac but nothing else really (soothe? no thanks) are not as good. And to all those saying that this item is no use because you get the spell at 39 anyways, there is a big difference. Your spell that you get at 39 uses up your mana. This is free. So hey, at 45 I can just disregard the spell gem for this and not worry about memming a spell. The tactic to go with--fight for a while, then root. While root sticks you can usually get in 4 "hat heals" and then get back to fighting, 400hp higher, and no mana less. 4 Hat Heals with one root... are you talking pre-nerf? You would be lucky to get one in against any mob you would need to root, back off, and heal against. Your root at around this level turns into more of a taunt than an ability to 'park' a mob. I live by my Deepwater Helm ^_^ it helps during those times your trying to find a group and find yourself soloing some easy exp stuff waiting for a call and this helm helps a lot. I don't tend to root then Helm Heal, i just blast off a Greater Heal or three off and jump back in. I use the Helm only out of battles to save mana because I am so impatient. I recently changed servers and boy do I miss this! I was soloing plaguebones at 47 the Combine outpost in the Dreadlands with almost no downtime. I originally traded 14 Coldain heads for it. Mana-free heals for 100+ hps (it takes a while to cast though.) And the AC is very nice. I just changed servers 2 months ago, I was workin on gettin this for my pally on my old server. Glad I didn't would have had a hard time letting it go, a friend on zev <new server> has this, it's insane, at 51 with arby combine greatsword he's killin Gornit, 2 seafury's and then med break, insane, then the process starts all over again. He lets me tagg along so I can practice my weapon skills on Gornit. Just bought this in the bazaar on The Rathe for 395pp. There were about 5 or 6 for sale around the 1000pp level and then this one. I don't know if this guy was being nice or just had no idea what he was selling, but frankly, I don't really care. Low price for a sweet item. Sorry bro, the daring right click won't work until 45. BUT..the day you hit 45 you make sure of all things a 45 Pally should have, you have this. This will forever change the way you play EQ. Example: Soloing HG's - beat on him awhile you get low on hp, root him and right click 3 times - beat on him - root, and right click 3 times, can't beat it. For the pp it costs, this is the most powerful item a pally has at that level. I don't care what weapon you have, UNLIMITED HEALS is unbeatable. #zigana, Posted: Oct 05 2001 at 11:39 AM, Rating: Sub-Default, (Expand Post) i'm selling one of these on the Nameless. I might consider a trade for a cool rogue or necro item, otherwise just send a tell or email me with a reasonable offer. Was lucky enought to have purchased this on Ayonae Ro server for 450pp. Great AC but I think the proc for Daring not coming into effect until lev 45 is a bit disappointing. As a Paladin ya get the spell at 39 anyway, why not at least let the thing proc at 30? What is the cast time on this? It's LONG - I'm guessing in the 8-10 second range. A good friend of mine (52 Pally) has this helm, and it's saved my bacon a number of times. In-combat heals with this should be done only in DIRE emergency. During that long cast time, you aren't meleeing. But for cutting group downtime between pulls, it's a champ. One other issue - Daring doesn't stack with the Druid/Ranger Skin Like XXXX line. So you may get some stacking issues, and find that your pally can't cast it on you if a friendly Druid has buffed you up. Casting time is definately 10 seconds, just got mine today. Anyone know if this is also a light source? I have one, and no it isn't a light source...why would it be? I don't think it's a matter of pallys not liking it, it's a matter of not being able to afford it. #illShowUm, Posted: Aug 01 2001 at 6:05 PM, Rating: Sub-Default, (Expand Post) I am trying to sell this and cannont get a single person to even send me a tell about it! I have ben trying to sel it for a week now! I am trying to sell it for 1k on the veeshan server! I must say that this is my most useful item. When soloing tough mobs i can root (30 mana), back up and heal for 550 hp, reroot etc. If your a 45 pally, get it! Can be purchased for 800-1k on rodcet if ya look. Okay I have no life except EQ so I think I will get my fungi from my monk give it to my lvl 30 pally and buy the help get him up to 45 so I can solo like mad. Hehe I am seriously going to do this. Okay I have no life except EQ so I think I will get my fungi from my monk give it to my lvl 30 pally and get him up to 45 so I can solo like mad. Hehe I am seriously going to do this. I'm a little confused. I just got this helm [pally 33]. It dosn't proc 'till 45? I get the spell at 39. What's the point? No mana used? There are essentially two advantages to having the helm, despite already also having the spell. First, as you conjectured, it's manaless. Second, it frees up another spell slot, which is never a bad thing. daring also give a 100hp heal as well as the buff so once you hit 45 you can use this to cut your down time in half when soloing and save mana for all healer types in a group between pulls.